Census research is the most efficient way to learn about a particular individual. This includes prostitutes. With information from city directories and fire insurance maps, it is easy to find the right location in census records. Begin by searching for the madams in the city directory on the closest census schedule. In this case, we have used the 1898 Savannah city directory and the 1898 Sanborn fire insurance maps for Savannah. The closest U.S. census was taken in 1900. (Remember, the 1890 census was almost completely destroyed, so there may be no available census during that time.) Census searches can be made through Ancestry.com, Heritage Quest, or FamilySearch. Finding the madams in Savannah was easy. Here is the house of Bessie Stafford at 238/240 Houston Street (from the Sanborn map in Part 2). A major benefit of the census is that the working girls are listed in the house. Although girls changed their name and other information about themselves, demographic data from the census appears to be closely related to the truth. 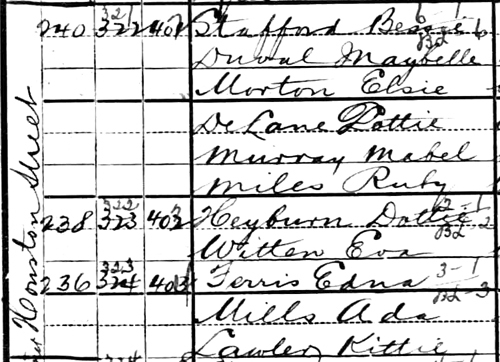 The 1880 U.S. census can be searched by occupation via Ancestry.com or FamilySearch.org. Searching for “prostitute” in Chatham County, Georgia (where Savannah is), reveals nine women. Directories, Sanborn maps, and the census are the three records that make researching your town’s red-light district a snap. In the fourth part of this series, I will summarize some other records worth looking at if you want to dig a little deeper.